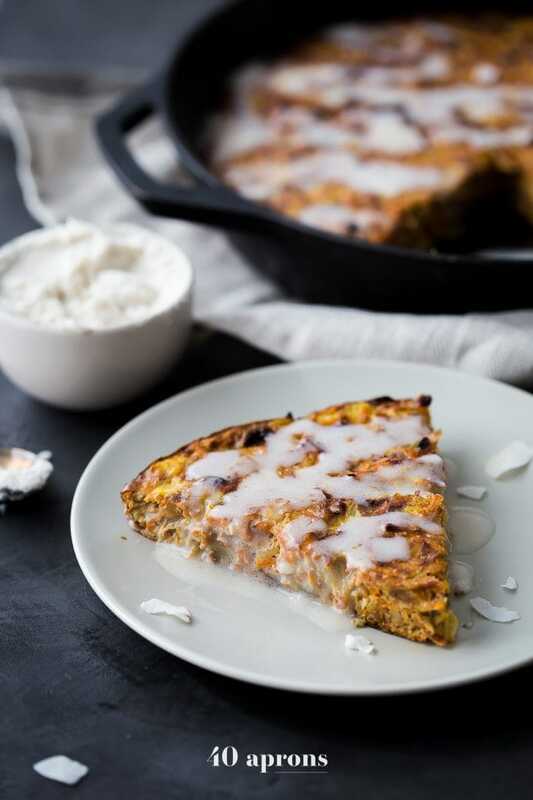 This carrot cake paleo breakfast bake is like eating carrot cake for breakfast! With pineapple, golden raisins, coconut, cinnamon, walnuts, and a paleo cream cheese glaze, this paleo breakfast bake is easy but delicious. Destined to become a regular on your paleo breakfast bake roster! This cast-iron skillet makes it so easy. This is one of those recipes that, from the moment I take the first bite, I just cannot wait to share with you. The juicy pineapple and the sweet raisins, the crunchy yet creamy walnuts, the heady, warming cinnamon, and the freaking inclusion of carrots at the breakfast table. The slightly tart, lightly sweet, and perfectly creamy “cream cheese” glaze. Oh, oh, oh. I cannot wait to share this with them. I was inspired during Easter, when the Internet was positively coated in carrot cake cookies and carrot cake cupcakes and carrot cake muffins; it seemed like anything that could be carrot caked was! But for a paleo breakfast? 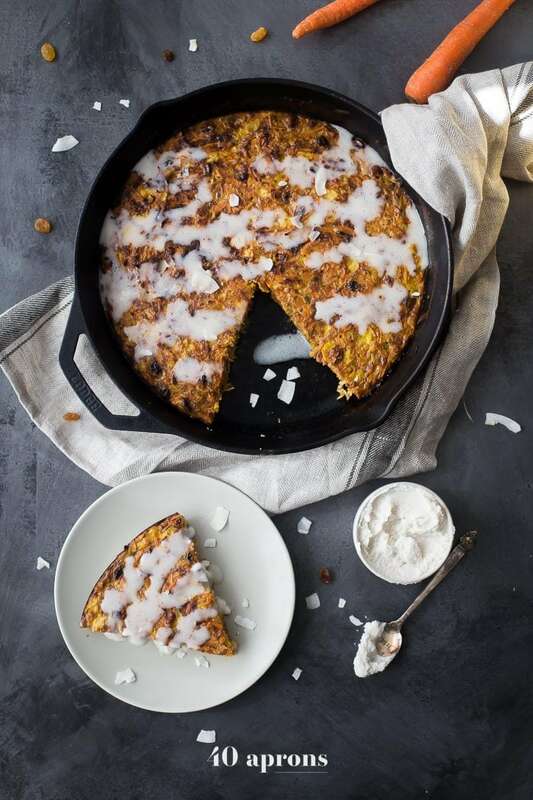 It’s worth waiting for this carrot cake paleo breakfast bake until it’s unfashionably late. 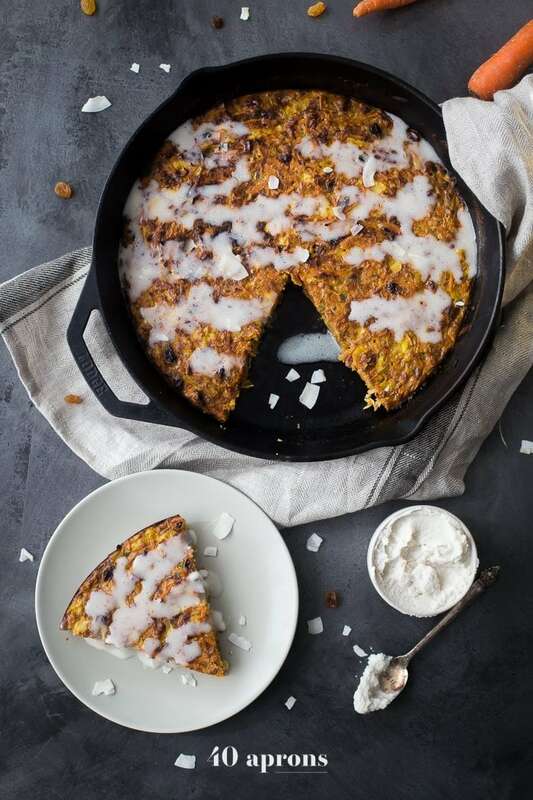 This paleo breakfast bake has all of our favorite carrot cake elements: pineapple, golden raisins, walnuts, cinnamon, carrots, and cream cheese. It’s moist and tender and doesn’t take like you’re eating veggies for breakfast! The cinnamon warms things up, with the cream cheese glaze to cool it back down. It’s a delicious balance, and I hope you love it as much as we do. The carrot cake paleo breakfast bake comes together pretty easily and is amazing as leftovers. It’s a fab recipe to make on the weekend as part of your meal prep and eat all week! Both the bake and the cream cheese glaze taste great, even after days. And you know what? Forget Easter; it’d be perfect for Mother’s Day brunch. Slash Tuesday morning breakfast at work. Slash dinner on Thursday in front of the TV (no judgment here, sister). 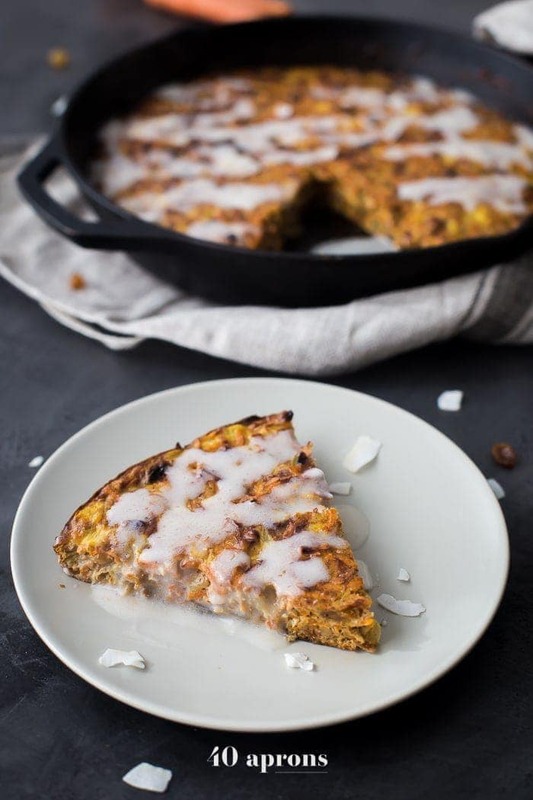 This carrot cake paleo breakfast bake is like eating carrot cake for breakfast! 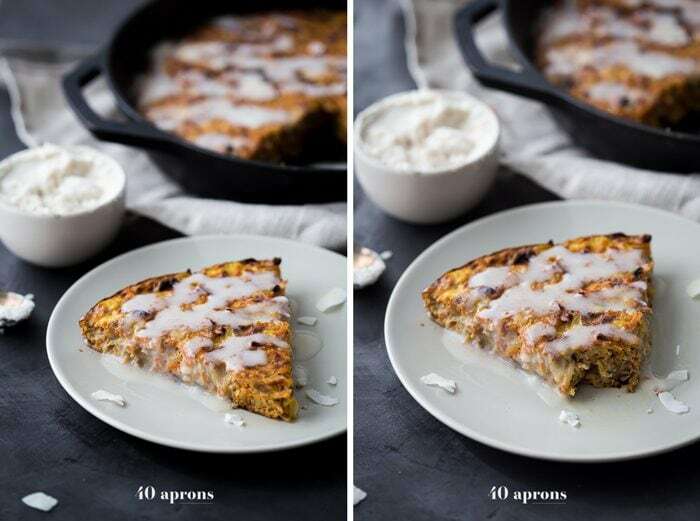 With pineapple, golden raisins, coconut, cinnamon, walnuts, and a paleo cream cheese glaze, this paleo breakfast bake is easy but delicious. Destined to become a regular on your paleo breakfast bake roster! Preheat oven to 375º F. In a large cast-iron skillet over medium heat, melt 1 tablespoon coconut oil. Add carrots and sauté until beginning to soften, about 2-3 minutes. Add raisins and cook until carrots are soft and raisins are softening, another 2-3 minutes. Add in walnuts, cinnamon, coconut, and pineapple. Stir to combine and remove from heat. pour eggs + cream over. 375 for 20 m and then broil. In a medium bowl, combine 1 tablespoon maple syrup (if using), 1 teaspoon vanilla extract, eggs, 1/2 cup coconut cream, and pinch of salt. Whisk until smooth. Pour over carrot-raisin mixture and smooth with a spatula. Bake at 375º F for 20 minutes or until a knife, inserted in the center, comes out clean. If desired, broil for a couple minutes to brown the top, but watch very carefully! The top will burn easily. Let cool 5 minutes before serving. While bake is in the oven, make your cream cheese glaze. Combine all cream cheese glaze ingredients and whisk until smooth. Taste, and add a bit more maple syrup, to suit how sweet you like it. Spoon over wedges over carrot cake bake, or drizzle from a pastry bag or plastic bag with corner cut out.